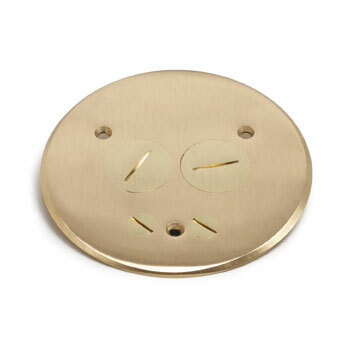 The Lew Electric TCP-2-PC is a brass seamless cover and flange. The cover features two 1.5″ screw plugs to gain access to the duplex outlet opening inside of the floor box, as well as two 1/2″ screw plugs for data connectivity. The cover comes with the duplex mounting plate, rubber gasket, and plate screws.